File photo by Lee Choo. For the second year in a row, the entertainment news website The Wrap has hailed California State University, Northridge as one of its Top 50 Film Schools. Listed among film school heavyweights University of Southern California (USC), American Film Institute (AFI), New York University (NYU), University of California-Los Angeles (UCLA) and California Institute of the Arts (CalArts), CSUN ranks at No. 21, one spot higher than the university’s rank on the 2017 list. Last year, The Wrap praised CSUN’s diverse cohort of students taking programs related to the film industry. It also drew attention to the expanded opportunities that a 2016 Hollywood Foreign Press Association’s (HFPA) $2 million gift lends to CSUN’s Cinema and Television Arts (CTVA) program. Another roughly $800,00 has been donated over more than 20 years in support of senior film productions. In September 2017, the Mike Curb College dedicated a wing of Manzanita Hall in honor of HFPA. 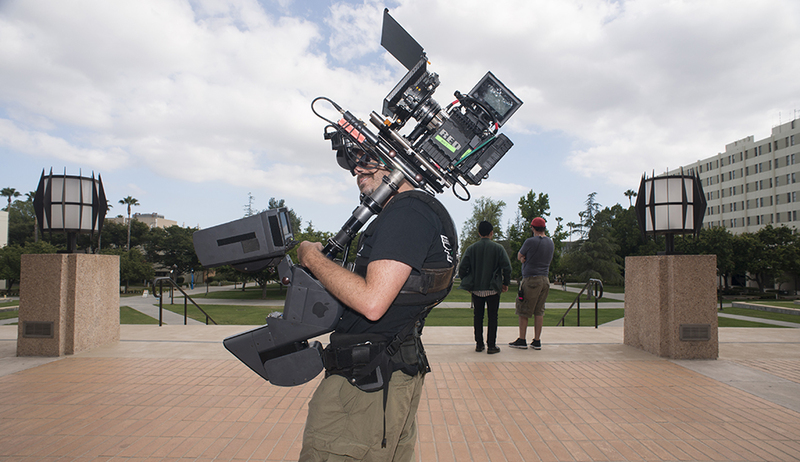 Major industry strides accomplished by CSUN CTVA students were highlighted by The Wrap. It recognized Martin Ibarra ’17 (CTVA) and Daniel Yonathan ’16 (CTVA), whose films Serve and Ben-Dod Sheli, respectively, were selected by the Academy of Motion Picture Arts and Sciences as semifinalists in the 44th Student Academy Awards. Additionally, Vestige, a film by Taylor Salan ’16 (CTVA), was also shortlisted in the British Academy Film and Television Arts (BAFTA) Student Film Awards. The Wrap also puts a spotlight on what’s currently happening within CSUN’s CTVA department. It notes the events being held at the CSUN Cinematheque, including The Poster Gallery Series’ film screenings on selected Mondays and the female-empowered “She Makes Media” screenings at 7 p.m. on Wednesdays in the fall. These screenings are free and open to the public.